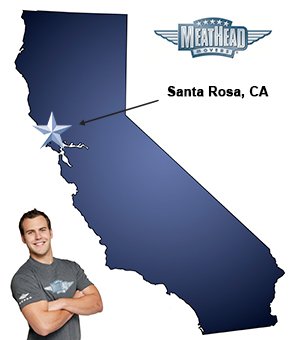 Whatever your moving needs may be, Meathead Movers will help you feel at home in Santa Rosa. Our professionally trained student-athlete movers and our moving concierge will be with you for the entirety of your move. Moving to Santa Rosa can signify a new and exciting phase in your life! Settling into a new home can be as overwhelming as it is exciting. Let Meathead Movers take care of the heavy lifting for you and start exploring your new home. With almost 170,000 residents, Santa Rosa is a comfortable and welcoming town with plenty to see and do. Located in northern California, it is close to wine country and the greater San Francisco area, but far enough removed to allow for relaxation. You and your family can explore the Children’s Museum and experience the best wildlife park at Safari West. The area is also well-known for being the home of Charles M. Schulz, the creator of the cartoon strip Peanuts. Schulz spent a good portion of his life in the city, and his influence is commemorated in a museum dedicated to his life and work. For the best moving service, look no further than Meathead Movers. Established in 1997, Meathead Movers has ample experience helping clients complete moves of all sizes and distances. Meathead Movers is readily equipped to assist with any part of the moving process, including packing, loading, storage, and hauling. Over the years, Meathead Movers has worked for both residential and commercial clients. Whether the move is across town or across the state, Meathead Movers can provide quality service any day of the week. Other movers may make similar claims, but none can compete with the Meathead difference. This is because we know that a good move starts with good movers. We employ polite student athletes, who are thoroughly trained to provide superior customer service and to move your possessions carefully and efficiently. To save you valuable time and money, Meathead employees will jog when not carrying your possessions. We are so confident in our services that we offer all clients a 100% satisfaction guarantee. So if you are considering moving to Santa Rosa, be sure to remember Meathead Movers. To learn more about the best movers available, please call us today for a free, no obligation quote. Moving to Santa Rosa? Here are some helpful resources. View more Santa Rosa resources. The guys were great and you all really have your act together. It was very easy and fast. No fuss Thanks Arlene "Magic Castle Cabaret"
Meathead Movers were recommended to my 92 year old mom when she made the decision to sell her home and move into town and then to northern California 350 miles away. The Princess Packers and the Athlete Movers were stellar. They were thorough, professional, strong,and careful with mom's possessions, but above all they were ALL kind and honoring towards my mom and did not marginalize her. They worked quickly and in our case worked until the job was done. Not one inch of storage space was left and it was packed as we had asked. Blake and crew were exemplary at loading. Moe and Joe unloading at the end into the apartment AND into storage, worked above and beyond the call of duty, just two guys and two trucks to the third floor of storage in record time, in the dark and cold. I would recommend Meathead Movers to anyone who is moving a short or long distance. Thank you for a super job! excellent ! thank you for the great service! I was so impressed with Raul and how intelligent and attentive he is. He paid attention to everything and was a great mentor to skylar who also worked hard. I was on the unpacking end and they maintained a wonderful demeanor throughout. Debra said the loading crew was terrific too. Thank you. I do not share my name on social media. Sorry.